After expanding their solar field at their Newfield Logistics Center, the solar field is expected to generate 100% of the power needed for this 255,000 square foot facility. 3,979,800 watts of solar panels were installed in RLS Logistics’ solar field. The solar system is expected to generate over 5,700,000 kilowatt hours of AC electricity in the first year. RLS Logistics also uses LED lights throughout all of their facilities. To reduce our environmental impact and improve the quality and quantity of light for employees at their Pittston facility, RLS replaced T-12 fluorescent and metal halide lighting fixtures with T-8 fluorescents throughout the office space and LEDs throughout our freezer warehouse and loading dock areas. The lighting upgrade has enabled us to shed 127.24 kW from the Pittston facility. The corresponding reduction in CO2 is equivalent to planting 117 acres of trees, saving 48,235 gallons of gas, and removing 75 cars from the road. RLS also encourages its “green initiatives” to their clients. RLS continues to encourage clients in its’ e-commerce business to use sustainable recyclable shipping containers, which has enhanced its client’s sustainability efforts, as well as, RLS Logistics. The annual Top Green Providers Award offers Logistic professionals a guide to the providers that have found new ways to promote sustainability throughout their operations. 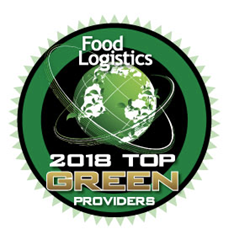 This year’s list consists of transportation providers, 3PLs, cold storage providers, technology companies, pallet manufacturers and many others who have stepped to the front to become the leaders in supporting a more sustainable global food supply chain. RLS Logistics is a third generation family-owned third-party logistics provider (3PL) specializing within the cold chain. The company is a leading frozen & refrigerated temperature-controlled logistics provider offering LTL and TL transportation, cold storage warehousing and e-commerce fulfillment services. For more information visit http://www.rlslogistics.com.